Hi everyone. It's August second and time to share a previous post over at Bleubeard and Elizabeth's blog for Second on the Second. 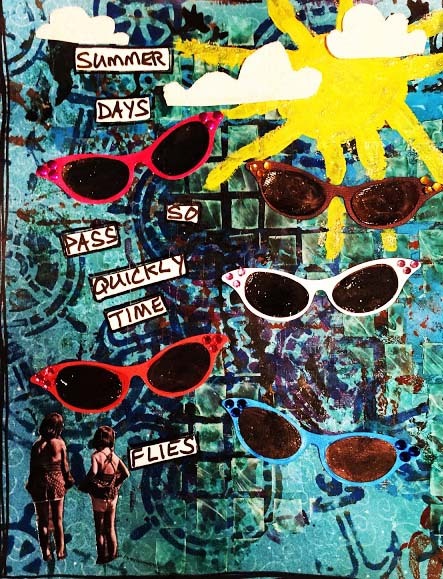 I'm going back to August 24, 2015 to share a fun summer page. Since it is already August I think the theme of this page is way too true. You can see the entire post here: Time Flies. And I also have a new page to link up to Art Journal Journey. This month Bleubeard and Elizabeth are our hosts and their theme is Count Your Blessing. I had some backgrounds pre-done and I grabbed this one because the colorful hibiscus flowers inspired me. Then I played with lots of stamps. I've been doing some studio cleaning/purging and I pulled out some stamps I haven't used in awhile. It was great to play with them because it was almost like having new toys. It is a blessing to be able to do what you love and have fun doing it. We're back into the hot weather humid today. It's been one of those summers-lots of heat, lots of humidity and lots of rain. Summer sure is flying by. I like the way the sunglasses look like butterflies. Always fun to find old toys that become new. Your hibiscus page is bright and sunny perfect for today. Enjoy the heat and humidity, Winter will be here before we know it. Your Time Flies summer page is fabulous. I thought it was great and it was a first look for me. I agree that summer does fly by, especially if you are not in school. I also was impressed with the photos you shared of the museum. You photographed some lovely pieces. Thank you SO much for sharing it as your second look on the 2nd. I think this is a fabulous second entry for my blessings theme. I had to laugh at your comment about old stamps were like having new toys. I was trying some new techniques last month and felt the same way. You have certainly put them to excellent use, and have made this a fabulous journal entry. I agree it's a blessing to do what we love, and you have shown it today with your journal page you linked at Art Journal Journey. Thanks so much for the great support. I love the Second Look page and I LOVE the new page ... this is so utterly beautiful Erika! You used the stamps in such a perfect artsy way - I am thrilled and more than happy to see this BEAUTY linked to Elizabeth's theme again! You just make me happy with your creativity and unique art! It's always so good we do a cleaning - we got new inspiration and find things we have forgotten about. Same to me always! Here it is humid and hot now as well----○◘• arghh! But we have summer haven't we?! Keep cool and creative Erika! Beautiful art pieces-Loving the sunglasses for the second look and I love your next one too with the pretty flowers and stamping. I love your August page with all those sunglasses. Perfect. The hibiscus page is lovely too. The colors are beautiful. To answer your comment, yes, it is the sister you saw recently. I have only one siste. And my mum did recover of course. She had haemorraged and suffered from post natal depression, so needed a bit of time to recover. She is now 94 as you know. We can all relate to the heat and humidity exuding from your pages, they do look warm. But they also look pretty! Something to dwell on in cold weather! This page is so summery with the bright pinks and lime green, a favourite combination. Glad you enjoyed playing with your re-found "toys". We are so lucky to have our art to play with. A great revisit page Erika, you sure need sun glasses on our hot sunny days. I also love the journal page with the gorgeous hibiscus flowers. It sounds like you found a few items to play with on your studio tidy up. Nearly as good as visiting a shop when we find gems like the ones you used today. I agree that finding old buried supplies you already have is almost like having new toys. And also, "It is a blessing to be able to do what you love and have fun doing it." I wish I could find some great backgrounds like your hibiscus hidden in my craft room. But that's not gonna happen (grin). Both pages are wonderful! Love those retro sunglasses and the hibiscus flowers on that gorgeous background look wonderful! I commented yesterday, but have been having commenting issues, so who knows where that went. Anyhow, just wanted to say how lovely and summery this looks! Can’t help but celebrate summer with art like this to enjoy. Have a good weekend! Both pages are wonderful Erika, and those gorgeous colours made me smile! I especially love your colorful floral page!